Welcome to Circle of Blue Radio’s Series Five in 15, where we’re asking global thought leaders five questions in 15 minutes, more or less. These are experts working in journalism, science, communications design and water. I’m J. Carl Ganter. Today’s program is underwritten by Traverse Internet Law, tech-savvy lawyers representing Internet and technology companies. 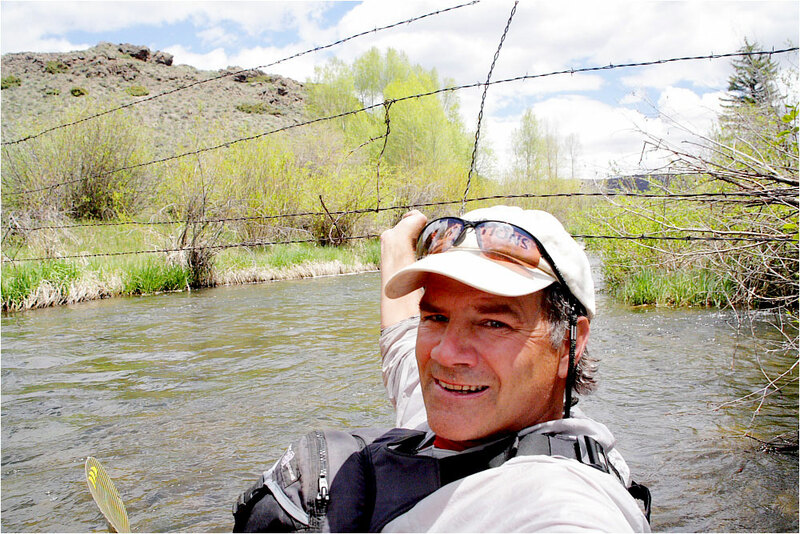 Jon Waterman paddling near the town of Granby, Colorado, where the river is shrunken by dams and often fenced off to boaters and anglers. And where state law still prosecutes boaters for trespassing on the iconic waterway. Our guest today is Jonathan Waterman, author of “Running Dry: A Journey from Source to Sea Down the Colorado River.” Since the 1993 paddle down the Gulf of California, starting at the mouth of the Colorado, Waterman has been fascinated by the river and alarmed by the demands being placed on its waters. He returned to the American Southwest’s iconic river in 2008. He lived on its waters for five months, paddled its length and then walked when the river ran out. It was in 1998 when the Colorado stopped flowing to the sea as it had done for millions of years before. It had been sucked dry miles short of the Gulf by a growing demand for drinking water in Los Angeles, Las Vegas, Phoenix and Tucson, and for agricultural use by farmers up and down its 1,500-mile length. Waterman talked with us about his trip, the many threats facing the Colorado and ways that he feels we can help. So, Jon, you paddled almost 1,500 miles down the Colorado River from the headwaters near the Rocky Mountain National Park. It’s quite an adventure. Tell us, why did you do it? Jonathan Waterman: There are a few answers. I took a long journey in 1993 down the Sea of Cortez and wrote a book about it called “Kayaking the Vermillion Sea,” and the journey essentially started at the delta, a little south of the Colorado River delta, in the muds that the Colorado River had washed down from essentially where we live, where you live, where I live. I was intrigued, even way back then more than 15 years ago, about the river. And then as over the years I’d heard that it was no longer reaching the sea, it had been on my radar for a long time. Also, in a more general way, I’ve been doing long journeys for 30 years now, and I’ve had the luxury, maybe the tenacity, to engage myself in landscapes and get to know a place by traveling and by sleeping out, and covering broad sweeps of the land and ocean coastline, and rivers. I wanted to do that same kind of thing with the Colorado River — get to know it by living on the river for months at a time. But my trips have always been to far, remote places. I wanted to do something close to home that impacts the future not only of myself and my children, but of all the 30 million people who depend upon the river. I wanted to give an up-close and personal view. So, help us get to know more about the river. Tell us about your discoveries through your quest and some of your concerns. Jonathan Waterman: That’s a wide net, so since you mentioned Las Vegas, I’ll start with Las Vegas. That’s certainly one of the places that gets a lot of the attention when it comes to the Colorado River, primarily because Vegas is right on the river, and also frankly because Vegas is known as the city of consumption, or Sin City. But, in fact, Las Vegas is in the future now. They have already kicked the future because they’re such a big city growing so rapidly, and 90 percent of their water comes from the river through Lake Mead. That’s a great place to go to understand how other municipalities might begin to get their arms around the issues of diminishing supply and droughts, and over-allocation. It’s not the only place to go, and farming, of course, is the central drain of the Colorado River. Seventy-eight percent of the water goes to agriculture in the Colorado River Basin. It’s a great place to begin because if farmers could implement more sustainable, farsighted — not even farsighted, but relatively technology-wise — simple drip irrigation, it would have immense savings. Those savings, of course, could be realized by municipalities that use a lot less of the water, but as the population continues to increase, places like LA, Vegas, Denver, even Albuquerque, Phoenix, Tucson, Salt Lake, all of those places depend to a greater or lesser extent on Colorado River water. If they all began sustainable xeriscaping in replacing front lawns, the savings there, too, would be immense. I’m really concerned that the public at large…even the 30 million people who depend upon the river don’t understand the issues of the river. There’s a lot of talk, even most recently from former Secretary of the Interior, that there is no scarcity of water in the Southwest. Nothing could be further from the truth. We’re in times of drought. The drought continues, even with big snow years the last three years, where I live. It doesn’t matter. The warming temperatures cause tremendous evaporation. We have a coming train wreck on our hands. Tell us, what did you hear from the farmers and the Native Americans who live near and depend on the river? What changes have they seen over the years? Jonathan Waterman: For instance, I spent time with a man who grew up in the river delta, Colin Soto. He’s a Cocopah Native American person, and as a right of passage as a boy, he swam the river. Now in his early 70s, there is no more river on his land, on the Cocopah Reservation, which is on the border of Arizona and New Mexico. It’s a great tragedy. It’s not only an environmental tragedy, but to these people, to many of the people who depend upon the river, it’s a cultural issue, as well as an environmental issue. I did speak to some farmers along the way. Fortunately, the man whom I spent the most time with was in one of the biggest irrigation districts on the entire river, called Imperial Valley, in California, and he had converted 7 percent of his fields to drip irrigation. And the savings were enormous. Despite the initial costs, he is implementing more and more drip irrigation on his fields. This is the future, and this is the kind of reform that we need to see, but it’s going to take some leadership. Not many of our leaders have such conflicting interests that they can’t seem to focus on the river as a whole, the river as a living being that flows not just for the sake of Denver or Phoenix, but it flows to reach the sea. We hear a lot about how the river’s down, how the Hoover Dam is running out of water. Tell us more about water scarcity. Jonathan Waterman: I think the best place to initiate it is with the end of the river. If we could, this is a starting place — make people aware, whether they’re one of the 30 million users or anyone in the country, that this iconic river stopped reaching the sea in 1998. I think, that’s a place from which everyone’s curiosity can be engaged and that they could learn more. They can also learn more, there are many websites, not only my own, www.jonathanwaterman.com, but www.savethecolorado.org is another great one. There is a map that was put out by the National Geographic Society. There’s no more information on a single piece of paper than this Colorado River Basin map. It shows the entire plumbing system and identifies many of the issues, like the fact that the river doesn’t reach the sea, and points towards potential conservation solutions. That map can be found on both of those websites, www.jonathanwaterman.com and www.savethecolorado.org. The Colorado River was recently named the sixth most endangered river on the annual American Rivers list. Jonathan Waterman: They name rivers every year, and this year they named the headwaters of the Colorado River as the sixth most endangered river in the country. That’s simply because the state of Colorado, as well as some of the other headwater upper basin states, including Wyoming, Utah and New Mexico, have not taken their full allocations of water like they have in the lower basin, in California, Arizona and Nevada. They’re beginning to take them all in the upper basin; they’re beginning to reach toward the river, and as they do, they deplete the river. For instance, the headwaters of the Colorado in my state in many summers — about this time of year, August and September, when there’s very little water in the river — are drained just about dry, as these diversions take water from the river itself under the Rockies through 12 different diversion tunnels and bring it toward the eastern slope cities and towns such as Denver. Give us a sense of how political policies and energy demands have shaped the current state of the Colorado. Jonathan Waterman: That’s a great question, and that’s one of the things that we have to keep our eye on for the future to sustain this river. That is, mineral resources, fossil fuels; it’s not only the tremendous reserves of oil, gas and oil shale, but it’s also uranium. Oil shale, in particular, is the scariest thing on the future because there is more oil under the ground in this shale — it’s actually not shale, it’s a micrite, and the substance is called kerogen. There’s a king’s ransom of this kerogen in the rock under the ground, and to get it out would take five barrels of water to every one barrel of oil that would be produced. It’s not only potentially very catastrophic in terms of the pollution or the damage that could be caused to the river by these underground kerogen removals from the oil shale, but it also is very consumptive and would demand a tremendous amount of the river’s water just to exploit the oil. That’s on the top of the list in terms of things that could really send the river into a tailspin. You’ve seen the river up-close and personal in so many senses. What makes this river, the Colorado River, so unique compared to others in the United States or even around the world. Jonathan Waterman: The reason the Colorado River stands apart from all other rivers is because so many people depend upon it. We basically have built this civilization in the West that includes the cities I’ve already mentioned, beginning with LA, and because of all the dependence and the ever-expanding populations, and the populations that now depend upon the river, it makes it very unique, not only as a source of water — virtual water, agriculture and some small amount of power — but it also has often invited comparison to the Nile in East Africa because of the number of riverside dependence. In addition to that, there’s a huge source of economy connected to the river, whether it be fishing, guiding, rafting, outfitters, or the tremendous amount of recreational boating that takes place on the many reservoirs. If the river were to collapse tomorrow, we would also see a good part of our economy in the Southwest collapsing. Tell us a little bit more about you. Tell me more about your own loves, paddling, and how this affects your life. Jonathan Waterman: We love the water, but we live essentially in a semi-arid place. While I am interested in going rafting on the river, I tend to think about my family and what we do, and how we live our lives in terms of how we live sustainably. We have built a life based upon a green or sustainable footprint, and try to use very little water. We deliberately only have native plants here in our yard and have drip irrigation for the vegetables that we grow in our big vegetable garden. We are constantly thinking about not only how to live with less of a carbon footprint, but also how to minimize our consumption of water. Because it’s not just how you live in your house day to day and how much water you use, it’s what kind of food you buy because much of our water comes from the food products that we eat. For instance, beef is one of the single most water-consumptive products that is out there. It takes about 1,800 gallons of water to make one pound of beef, or it takes over 700 gallons of water to make one T-shirt. These are things we have to start rethinking — can we continue to live this way with the luxuries that we’ve come to expect as American consumers and sustain this iconic river of ours. You have children, and I imagine they’re water-literate. What’s their perspective How do they compare to other 21st century kids? Jonathan Waterman: They do. They talk about getting out of the shower quickly. Because of my time on the Colorado River, they came and joined me for more than several days. They know that I’m always thinking about it. They talk about dams, but they talk not with the rhetoric of environmentalists. They talk about with curiosity, and we’re hoping to prime them with the ideology of building new models on how to live sustainably. It’s not just water, but it’s energy, and the two are ultimately connected. We’ve been speaking with author Jonathan Waterman. And his new book, “Running Dry: A Journey from Source to Sea Down the Colorado River,” is in stores now. To find more articles and broadcasts on water, design, policy and related issues, be sure to tune in to Circle of Blue online at 99.198.125.162/~circl731. This interview was performed by Heather Rousseau and produced by Steve Kellman. Our theme is composed by Nedav Kahn. Circle of Blue Radio is underwritten by Traverse Legal, PLC, Internet attorneys specializing in trademark infringement litigation, copyright infringement litigation, patent litigation and patent prosecution. Join us gain for Circle of Blue Radio’s Five in 15. I’m J. Carl Ganter. Jon, I just found letters that you wrote to me back in 1980. I was helping my Dad and siblings clean out my parents home in Tuscaloosa, Al. as my Mom died 4 years ago and Dad remarried. How are your parents? Do you ever get back to Lexington or keep in touch with high school folks? ( I don’t.) I’m living in Ct. and have 2 boys, 21 and 19. My younger one just finished his 2nd year at Boulder and older is finishing up at U of Connecticut. How many kids do you have? Enjoyed reading about your trip down the Colorado River.I didn’t know you were an author, but knew you were an “outdoorsman”, climber, and all. E-mail me back if you’re not too busy; my life’s pretty chaotic as a solo private practice physical therapist. My best to you and family.